Antibiotics are powerful, they fight off infections and save lives. 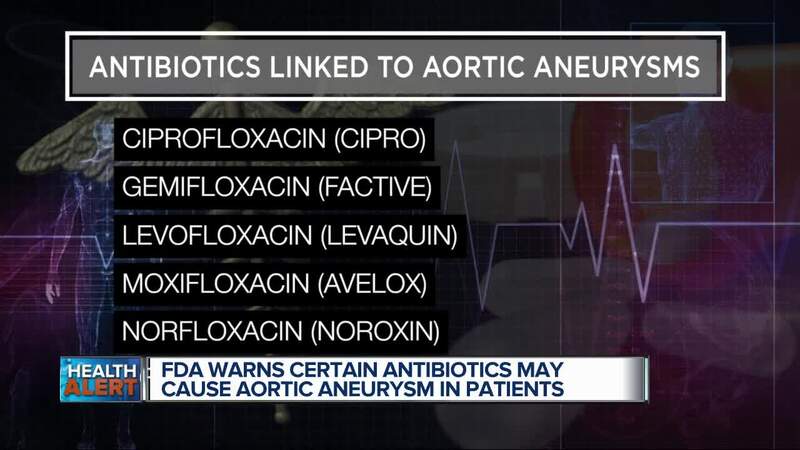 But the FDA now warns us that a common class of antibiotics could cause an aortic aneurysm. And this could lead to fatal bleeding. The class of antibiotics is called Fluoroquinolone. There are used to treat a variety of illnesses like pneumonia, urinary tract infections, respiratory infections, and the plague. (WXYZ) — Antibiotics are powerful, they fight off infections and save lives. But the FDA now warns us that a common class of antibiotics could cause an aortic aneurysm. And this could lead to fatal bleeding. The FDA looked the latest research, focusing on studies between 2015 and 2018. And they found that when patients were prescribed a fluoroquinolone drug, they ware twice as likely to have an aortic aneurysm. Now the aorta is a major blood vessel. Its job is to carry blood from your heart to your body. And if you have an aortic aneurysm, this means an abnormal bulge or ballooning has happened in the wall of the aorta. And if it grows large enough, it can burst. And dangerous bleeding can happen, or even death. People who have an increased risk include the elderly, folks with high blood pressure, anyone with a history of aneurysms or blockages of blood vessels, patients with peripheral atherosclerotic vascular diseases, and those with genetic disorders like Marfan syndrome and Ehlers-Danlos syndrome. If you are taking this medication, please don’t stop using it before discussing it first with your doctor. Because Fluoroquinolones may be the only antibiotic treatment to fight what illness you have. But if you get symptoms like sudden, severe, and constant pain in the stomach, chest or back, you need to get emergency help immediately. Now fluoroquinolones have been used for 30 years. And overall, the risk of an aortic aneurysm is low. So if you’re not in the high-risk category, this antibiotic could still be a good option to fight bacterial infections. This week on the Dr. Nandi Show, we’re investigating how today’s sports are hurting our children. Shockingly the number of young athletes across all sports suffering from head traumas has increased by 200% over the last decade! Great efforts are being made to make sports safer, but as a parent, I still have to ask, “would I let my sons risk brain injuries for the sake of a game?” Tune in this Sunday, December 23rd at 5 pm and hear how former wrestling pro Chris Nowinski suffered multiple concussions and thought he could just “shake them off’. Also, wife of NE Patriots player Dennis Wirgorwski speaks out about depression and her husband’s suicide. And Brain Disorder Expert Dr. Daniel Amen discusses a major study on NFL players.